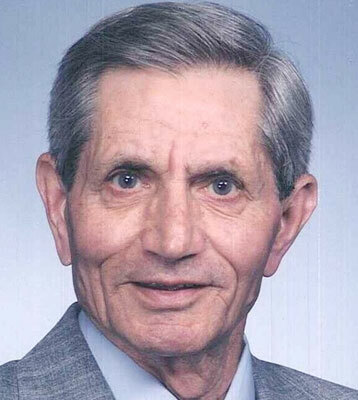 GUY (GAETANO) LALAMA POLAND – A Mass of Christian Burial will be held on Monday morning at 11 a.m. at St. Christine’s Catholic Church for Guy (Gaetano) Lalama, 92, who died on Friday at Briarfield Manor. Guy, known as affectionately as “Grampee,” was born in Pacentro, Italy, on June 26, 1920, a son of Gioacchino and Mary Louise DeChellis Lalama. He served in the Italian Army during World War II and came to America in 1950. He worked as a bricklayer for the Youngstown Sheet & Tube Company for 30 years and retired in 1980. Guy leaves his son, Richard G. (Lorrie) Lalama of San Diego; three daughters, Mary Lou (John) Allen of Poland, Cynthia (Phillip) Ricciulli of Niles, and Bettina Phelps of Boardman; seven grandchildren, Sonya (Robert) Ricciulli –Artman of Niles, Dr. Angel Ricciulli of Niles, Natalie Ricciulli of Niles, John (Shelly) Allen of Poland, David Allen and fiancée Natalie Trafford of Columbus, Richard Phelps of Sarasota, and Bryan Phelps of Chicago; three great-grandchildren, Katie and Joshua Allen and Hunter Artman; and his former wife, Mary Liberatore of Jacksonville, Fla. Guy was preceded in death by his brothers, Carl Lalama and Sam Lalama; a sister, Theresa DiNello; a son-in-law, Richard Phelps; and Guy’s companion, Dorothy A. Calvert. The family wishes to extend their appreciation to the staff of the Inn at Christine Valley and Briarfield Manor for the kindness and the wonderful care they provided to Guy. Friends may call on Monday from 10 to 11 a.m., one hour prior to the Mass, at St. Christine’s Church, 3165 South Schenley Ave. The family requests that donations in Guy’s name be made to Hospice of the Valley, 5190 Market St., Youngstown, OH, 44512 or to the Rich Center for Autism at www.web.ysu.edu/gen/richcenter or call 330-941-1927. Please share your memories of Guy.